Featuring the same stunning four-color artwork seen in Stretching Anatomy, the Stretching Anatomy Poster Series consists of two posters that will help you minimize muscle soreness, reduce the risk of injury, and improve mobility. 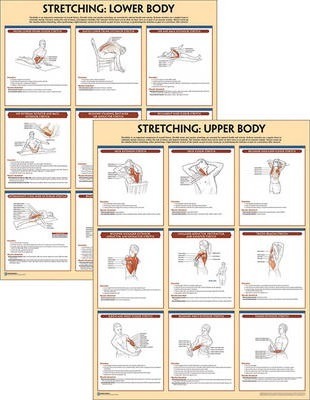 The Upper Body poster presents nine stretches for the neck, shoulders, and arms: – Neck extensor – Neck flexor – Beginner shoulder flexor – Beginner shoulder extensor, adductor, and retractor – Shoulder adductor, protractor, and elevator – Triceps brachii – Elbow and wrist flexor – Beginner wrist extensor – Finger extensor The Lower Body poster presents nine stretches for the trunk, hips, and legs: – Prone lower-trunk flexor – Seated lower-trunk extensor – Hip and back extensor – Hip external rotator and back extensor – Beginner standing bent-knee hip adductor – Recumbent knee flexor – Intermediate lying knee extensor – Beginner plantar flexor – Beginner seated toe flexor Whether you seek increased flexibility, better athletic performance, or reduced muscle soreness and tension, the Stretching Anatomy Poster Series will be your visual guide to proper stretching technique. Individual poster size: 24 by 31 inches (60 by 80 cm) Posters can be purchased as a series or individually.